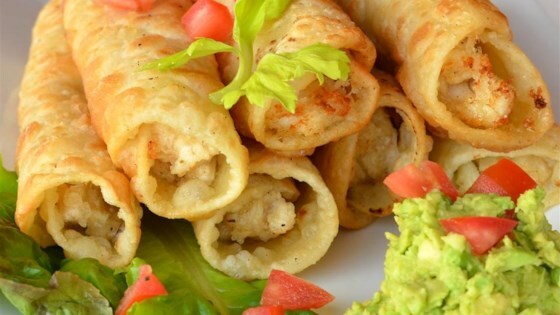 "Rolled tacos; these are the best. I learned how to make them and my husband loved them." Melt butter in a skillet over medium heat; stir flour into butter until smooth. Add onion to flour-butter mixture; cook and stir until onion is softened, 5 to 10 minutes. Mix black olives, lemon juice, oil, paprika, black pepper, and salt into onion mixture; cook and stir until heated through, about 2 minutes. Stir chicken into mixture and remove skillet from heat and cover. Heat oil in a large, heavy saucepan or deep-fryer. Fill tortillas with chicken mixture. Roll tortilla around filling and secure with a toothpick. Fry the rolled tortillas, working in batches, in the hot oil until browned, about 2 minutes. Transfer fried tortillas to a paper towel-lined plate using a slotted spoon or tongs. Quick and easy creamy chicken enchiladas are sure to be a family favorite. Yummmmmm! With a family of 7, I'm always on the look out for new Taco Tuesday ideas (you know, I don't want to keep repeating the same meal every week!). Everyone LOVED these flautas! I didn't have Paprika so I added 3 generous shots of our favorite hot sauce and one tablespoon of green chiles - they were a hit!